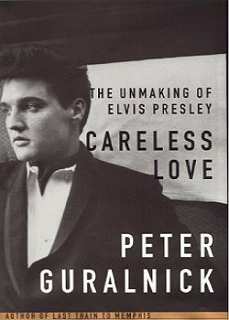 Careless Love completes Peter Guralnick's massive biography of Elvis Presley; the first volume, Last Train to Memphis, was published five years ago. Together they encompass more than 1,300 pages, some 1,150 of which are text, making Guralnick's Presleyan undertaking comparable to Edmund Morris's projected two-volume biography of Theodore Roosevelt and not far short of Taylor Branch's three-volume work in progress about the life and times of Martin Luther King Jr. This raises an obvious point but one that was not, to my knowledge, much addressed in reviews of Last Train to Memphis, which tended toward the adulatory ("the first great rock-and-roll biography") or wildly extravagant ("a masterpiece"). The point is that American life and culture have changed, that a substantial figure of popular culture must now be weighed in terms comparable to those once reserved for politicians and social visionaries. Guralnick is the first biographer to recognize this and to approach his subject accordingly. The question that must therefore be asked is whether his Presley is indeed a biography on the grand scale, whether he not merely argues the case that Presley deserves to be presented in such terms but proves the case as well. The answer -- my judgment -- is a highly qualified yes. The reservations arise in part from the character of Presley's life and work, in part from the methods by which Guralnick explores them; the biography, in toto, simply is not as accomplished as reviews of the first volume would have us believe. But on the larger matter of Presley's claim on our serious attention, of his place in the firmament to which major American lives are consigned, Guralnick makes his case. Presley's artistic legacy is relatively small -- far smaller than Guralnick believes -- but his influence on American life has been vast, and he must be treated accordingly. For many this is bitter medicine. Roosevelt and King, each in his own fashion, were heroic figures; by no stretch of any sane imagination can Presley be regarded as such. He was a bright but ignorant and coarse man -- good at heart but severely limited in many other ways -- who instinctively understood, as few before him really had, that the music of black and white Southerners was rooted in common ground. What he did with this understanding transformed American culture and American life, but it did not transform Presley himself. For a number of reasons -- some inherent in his own character, some the influence of others -- he did not change, but remained always a Mississippi country boy, almost entirely devoid of taste as the word is conventionally defined by the likes of thee and me. Not merely does this make it hard to take him seriously, it also makes him easy to deride. The latter was done to notably repellent effect in the last Presley biography to cross my desk, Albert Goldman's Elvis (1981), wherein the author, a quondam professor at Columbia, ridiculed Presley every which way, from his girth to his cuisine to his raiment to his sexual appetites and peculiarities. It was a nasty book, written in spectacularly execrable prose, but the view of Presley that it expressed dovetailed in many instances with my own, and in spite of itself I found things in it to admire. Peter Guralnick respects Presley far more than Goldman did and treats him far more fairly. If this leads to excesses of enthusiasm (he overpraises too many of Presley's campy movies and mediocre recordings), it also leads to sympathy and compassion. The first volume of his biography, in which Presley emerges from nowhere to become the dominant figure in American popular music, is, as he says, "an heroic story," one he tells with admiration and delight. The second volume, in which Presley finds himself trapped in his fame and in the "game plan" of his manager, the legendary Colonel Tom Parker, is "a story of celebrity and its consequences" and "a tragedy" into the bargain, one he tells with pity and sorrow. It is a tale of decline and fall to which Guralnick devotes nearly 700 pages of text. This, to anyone who has worked at the craft of biography, is an astonishing decision. Against the received wisdom, Guralnick implicitly argues that the story of failure is as important as the story of success, that Presley's collapse matters as much as his rise. Rather than concentrate on the relatively few high and memorable moments of Presley's life, Guralnick has chosen to give us the life in full, to proceed toward its debased and pitiful end at a pace as slow as that by which Presley himself lived it. This is a matter about which different readers will have different, and perhaps equally valid, judgments. Mine is that a single detailed account of any one of the many concert tours Presley made in the last half dozen years of his life would have sufficed as a description of them all; that the parade of young women who moved through his disorderly chambers soon dissolves into an indistinguishable and irrelevant blur; that the recitation of the various uppers and downers to which Presley became addicted and by which he ultimately was killed is, though necessary, allowed to go on too long. Just as the Paris years were far more important in the life of Ernest Hemingway than the protracted self-parody that was the rest of his life, so too what Presley did in Memphis is more important than what he did in his own protracted self-parody. That Guralnick's biography is out of balance -- that he has failed to discriminate between what matters and what does not -- is at least arguable. "It was clear that [Presley] himself was neither interested in, nor satisfied with, the music that was being released in his name, and for all the Colonel's pep talks and recitations of figures, numbers and deals, there was no getting past the fact that the records were no longer selling as they once had, they no longer mattered as they used to. He admired the Beatles, he felt threatened by the Beatles, sometimes it made him angry how disrespectful the Beatles and Bob Dylan and the Rolling Stones were toward the public and their fans -- but most of all he was envious of the freedom that they evidently seemed to feel and to flaunt. He, too, had once enjoyed that freedom, he, too, had once been in the vanguard of the revolution, and now he was embarrassed to listen to his own music, to watch his own films." If Presley's story is a "tragedy," here is the key to it. If Presley was brought down by a tragic flaw, it was not greed or self-indulgence -- as the fat, semi-coherent, stupefied Presley of the later years would lead one to believe -- but innocence and gullibility. Colonel Parker was not as bad a man as legend has it (one of the strengths of Guralnick's book is that he persuades us of this), but he had a plan for Presley not as a musician but as a product. Presley succumbed to the Colonel's seduction because he held the Colonel in awe, because he did want to be rich and famous, because the Colonel's way was the easy way. In so doing he abandoned the small but hard and bright artistic vision he had once possessed, and the rest of his life was a waste. Guralnick most persuasively argues that no one knew this more keenly than Presley himself and that it, really, was what killed him. Undoubtedly the completion of Guralnick's 11-year project will inspire evaluations not merely of the biography itself but of its subject. While reading the book I listened to a fair amount of Presley's music, from the Sun years to the tour years, the net effect of which was to persuade me that in time he will be regarded as much more important for his influence on others than for his own accomplishments; they are, like his vision, hard and bright but small. In this too he resembles Hemingway, another American tragedy. Jonathan Yardley's Internet address is yardleyj@clark.net.